Amanda Holges gives 3 Steps to Knowing your ‘Why’ in Business to enable it to support the Life You Desire. The important part is to be clear why you are in business, and to keep that in focus as you move forward to make sure it is keeping up its side of the bargain. This video looks at what your business needs to supply, as well as income, and what first steps can you make to achieving that Desire. 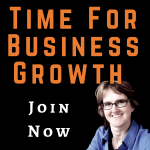 – Thank you for joining me on this Time for Business Growth tip. Today, we’re going to look at three steps to your business supporting the life that you desire. What’s the ‘Why’ in your business? The reason behind building a business, and what it can give you personally in return. Perhaps it’s to pay the bills or to enjoy trips away. Perhaps a better lifestyle, want to send the kids to college. Perhaps it’s to help others through your actions or to fulfil an ultimate big business dream. The important part is to be clear why you’re in business and to keep that in focus as you move forward to make sure it’s keeping up its side of the bargain. You see, business needs to be set up a lot differently if it’s needed to cover the bills or to become a multimillion-pound business. Neither is any less important, but the scale and outcome will be very different. So why did you set up your business, and what do you want it to achieve for you? I have been part of a family business that I helped grow into a multimillion pound international company. Growing the business through hiring staff, expanding distribution, and growing with changing technology and markets was difficult at times, but also very rewarding to see a business flourishing, achieving international acclaim and ultimately, the interest of outside investors. Today, in my mentoring business, knowing my ‘Why’ is just as important, even if the scale is a little more personal. I may not have 50 employees to oversee, but I still need to make sure my team know my vision for the business and what I want it to achieve. I may not be shipping large quantities of physical products overseas, but I still need to be aware of how things differ between countries and the advice that I may give. A difference of scale in business, but one thing remains. My ‘Why’. My ‘Why’ is my family and the life experiences I want to enjoy with them. Last year my wife underwent treatment for breast cancer, so certain plans went on hold whilst we reassessed life, and all it wanted to throw at us. Being self-employed meant I could be with her when I needed to be, but the business took a bit of a back seat for a while. Going forward, I see things differently now for my life and my business. My eldest son has just finished his first year at university, and my other son is awaiting his GCSE results and I want to enjoy times with them whilst they still want to be seen with ‘Mum’. I have elderly parents and I support my mum daily with living well with dementia, so my business has to be flexible enough to fit around caring, appointments, and urgent calls. The vision for my business has had to adapt and change, but my ‘Why’ is still very much the same. My business is planned to support that ‘Why’ in a new way. Business that can be flexible enough to cope with sudden changes in caring for others and that can support the life I want outside of work. Time with my family and new life experiences while still giving me the platform to help other businesses achieving their desires, too. My business also needs to be able to give me the opportunities for my own professional standing as an experienced businesswoman, speaker, and mentor. You see, I want that for the businesses I work with, too. for their businesses to support the life they want, A fulfilling business and a fulfilling life. So do you want a business that does just that to support the life you want to achieve? To clearly understand your ‘Why’ for your business and to take the steps towards achieving that? Don’t get me wrong. I don’t mean that you’re not enjoying your work. I personally get a lot of enjoyment out of seeing others achieving their goals and getting more out of their day. However, the smile and excitement on the face of my son when we have an amazing time, that’s what it’s all about. Experiencing life. Living it, not just struggling through it. If your life is going through the motions, then it’s not a life. Perhaps my wife’s health scare has made me sit up and realise that life is for living now, and my business needs support that. Does yours? So what are your reasons behind the work? What is it that you want to have the chance to experience? By finding out what the real motivators are behind what you want to achieve, you can make them a reality. Understand what it is you want and the steps that you need to take to get you there, and you can put in the structure and organisation to help you get your real desire. A little bit of something indulgent or simply time alone or with friends. The things like the time and money to explore and enjoy amazing times are often lost in the hustle of an unplanned day, or wasting time on repetitive and mundane tasks. In reacting to the needs of others. By having a clear plan of what it is you want, putting in some processes, and learning some new habits, you will start to lose the overwhelm and unnecessary tasks and enjoy a lot more clarity and calm. From that, you can focus on getting the time and money for the life experiences that you wish you could enjoy. Here are my first three steps to having a business that will support the life you desire. Step #1 Do you know your why behind what you do? Make a note of the real reason behind your business. What do you want your business to enable you to do both professionally and personally? Think about the short term through the coming year and the longer term for future plans in your life. Step #2 Does your business support that yet? If not, what does it need to provide and when? Money, time, flexibility, less stress, less juggling, new opportunities. Make a list and put some clarity into it. How much money? What type of flexibility? What type of new opportunities? And what time scales or deadlines are there? Step number three, take the first action. What can you do now to take the first step towards the reality of a business that supports the life you want to lead? It could be as simple as pinning up your why somewhere prominent as a reminder, or a picture of what you want to achieve as your screensaver, or booking an hour to sit down and plan what your business needs to do to support the life you want to lead. If you need help understanding what you really desire and how your business can support it, I have helped others do just that. Get the clarity in their why, controlling their day and cash flow, and understand just how their business can meet their needs better now. If you’re currently wishing you can get more out of your business and enjoy the life outside of it, then maybe I can help you, too. Download my 15 minutes to Understanding your Desire at amandaholges.co.uk/desire. In just 15 minutes, you will have a better understanding of your desires, the reasons behind them, and the first step you can take. It also has details of how I can personally help you get the clarity in what you desire and how your business can support that. So download my Understanding your Desire worksheet at amandaholges.co.uk/desire, and start the first steps to your business supporting the life you desire now. Thanks for listening today. Speak soon.